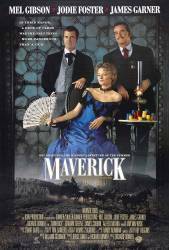 Trivia: Marshall Cooper is played by James Garner, who played Bret Maverick in the 1950s TV series. Trivia: In accordance with the other trivia entries about Mel Gibson and Danny Glover; if you listen when Gibson takes down Glover's bandana you will hear the exact music that you hear in the Lethal Weapon movies. Maverick: My old pappy always used to say, "there is no more deeply satisfying religious experience... than cheatin' on a cheater." Zane Cooper: I never said that once. You've been misquoting me all your life. Maverick: What, we're going to quibble over fine points? Zane Cooper: You never even get close. Give me some credit. Maverick: I've just noticed something. Maverick: You can't help it can you? You are irresistible.